Ignacio Abecia (left) and Josephine Fernie (right). 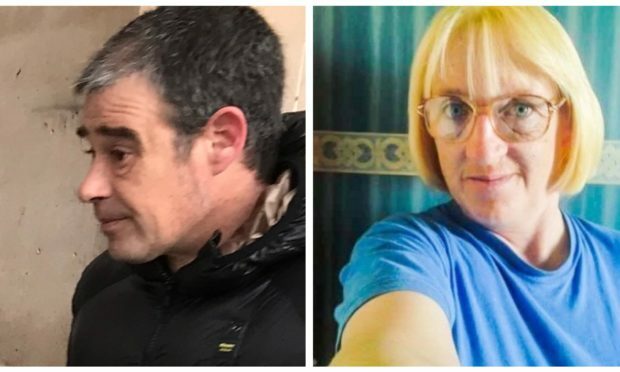 A motorcyclist who killed a dog walker after he rode onto a “pitch black” country road with no lights switched on before panicking, mounting a pavement and ploughing into the woman has been spared jail. Ignacio Abecia smashed into Josephine Fernie on the A917 road between Pittenweem and Anstruther on November 16, 2017 – causing her horrific injuries that killed her within minutes. A sheriff agreed he had been guilty of a “momentary lapse” in concentration which led to the tragic death of the Fife mum. Dundee Sheriff Court heard Abecia had stopped to fill up his Triumph TT600 motorbike at a garage in Pittenweem minutes before the crash. He was seen on CCTV turning off the lights as he used a petrol pump – then moving his hand towards the headlamp switch as he set off again. However, the light did not come back on. Seconds later he left the Fife coastal town as he headed towards nearby Anstruther – plunging him into total darkness on a road described by one witness as “pitch black”. Realising his light had not come on he tried to turn it back on as a car came towards him. In that moment his bike lurched across the road, up on to a pavement at the side of the opposing carriageway and careered into council worker Mrs Fernie, 53, who was walking her dog towards her father’s house at the time. Dundee Sheriff Court heard witnesses frantically tried to give Mrs Fernie CPR at the side of the road – but that she died at the scene having suffered a complete tear of an artery in her heart. Fiscal depute John Adams told said: “The accused was seen by police and when spoken to said: “‘I didn’t have any lights on the bike and I didn’t see anything in front of me. “‘I didn’t see the woman because I didn’t have any lights, I didn’t know what bit of road I was on. “‘I hit the woman and then I flew off the bike. I’m sure I had lights on. Abecia was thrown into a field by the impact and suffered a fractured shoulder blade and a fracture of a thoracic vertebra in his back. The 46-year-old, of Sou’wester Court, Cellardyke, pleaded guilty on indictment to a charge of causing death by careless driving. His defence advocate, Barney Ross, asked Sheriff Drummond not to jail Abecia and asked her to impose a community payback order with unpaid work as an alternative. He said: “Mr Abecia tenders his unreserved apologies and sincere condolences to the family and loved ones of Josephine Fernie. “He appreciates however that no expression of his remorse, however sincerely felt, can lessen the impact her tragic death will have on them. Mr Ross said that imprisonment would not be appropriate under the sentencing guidelines, having regard to the nature and gravity of the offence. He said Mr Abecia had an otherwise exemplary record with no previous convictions, a clean driving licence and he had demonstrated genuine remorse. He said his client had been deeply affected by the tragedy, suffering nightmares, insomnia and had “cried for a month” after the accident. “He finds it very hard to live with the burden of guilt that he has caused the death of Mrs Fernie through his own fault,” he added. He also stated that Mr Abecia had taken full responsibility for her death from the outset and had admitted his guilt immediately to police officers and the emergency services. He said Agnecia had come to Scotland from Spain with his wife Natalia and two children in 2011 and had set up a seafood business in St Monans with a business partner. “It is a successful business, selling shellfish to customers all over Europe and they employ 21 people,” he said. Sheriff Lorna Drummond QC placed Abecia on a community payback order with 200 hours of unpaid work and banned him from driving for 16 months. She also ordered him to resit the extended driving test. She said: ”Mrs Fernie was a much respected member of her community and much loved by her family. You have recognised the terrible effects this has had on them and you yourself find it hard to live with that burden. “This was a momentary lapse in concentration, you were not speeding and not under the influence of anything at the time.